After recently writing about four major retirement spending strategies, Life Annuities, Time-Segmentation, Floor-and-Upside and Systematic Withdrawals, I received a number of comments at this blog and at Wade Pfau's Retirement Research Blog that began with, "The thing that's missing from this discussion is. . ."
Some mentioned that the topic of Required Minimum Distributions was missing. Others mentioned the risk of high long term care expenses late in life wasn't discussed. Truthfully, many risks are omitted from the discussion of retirement spending strategies. The reason these risks weren't discussed is that the spending strategies I reviewed are intended primarily to mitigate only longevity risk, or the risk that you will run out of money before you die. A retirement plan should address all identifiable financial risks of retirement, but these four strategies aren't retirement plans, they're potential pieces of a comprehensive retirement plan. I think this gets a little confused by systematic withdrawal strategies that lump all future liabilities into one pile and attempt to mitigate all risks by creating a large enough pile of money to address whatever pops up. That may be the most efficient way to create a lot of wealth, but it might not be the most effective way to prioritize, manage and meet liabilities. Many economists prefer to match resources with future liabilities so each can be addressed in he best way. 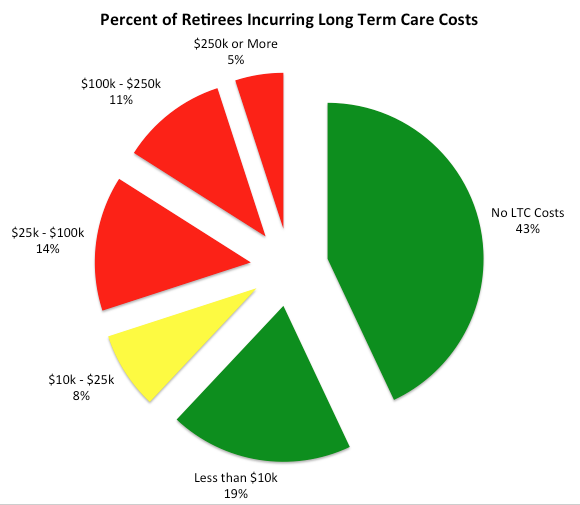 LTC costs, as I showed in a post about Long Term Care Insurance a while back, will be near zero for about 40% of retirees, manageable out of pocket for more, and catastrophic for a few. The spinal injury Christopher Reeve suffered, however, is estimated to cost about a million dollars for the first year of the injury and nearly $2M annually for subsequent years, according to the Christopher and Dana Reeve Foundation. That's an enormous range, from zero to $2M a year. And your LTC costs, if you experience them at all, may be decades in the future. Hardly anyone can set aside millions of dollars "just in case". In contrast, we can estimate annual "normal" retirement income needs relatively accurately and we know for certain that we will have those costs. The only real question is for how long. That is a very different animal than LTC cost risk and I prefer to address each with its own portfolio. "Why do you recommend a separate portfolio?" one of my readers responded. "Why not just change your asset allocation?" another wondered. First, because you need to decide what portion of your financial resources you are willing to dedicate to each goal. Most people can't secure their retirement income needs and save another several hundred thousand dollars to address a large liability they might never have. Building two portfolios forces you to decide how to allocate your investments. If forced to choose, I suspect most people will value sustainable retirement income more than avoiding spending the last of their wealth at the end of life. Second, you need to decide on a portfolio asset allocation. If you want to minimize longevity risk, allocate something like 30% to 50% to stocks. That will dampen portfolio volatility and reduce the chances of depleting your portfolio, according to William Bengen in Conserving Client Portfolios During Retirement. To have the best chance of growing a very large amount of money to cover large LTC costs 20 to 30 years in the future, you would want a much higher stock allocation, maybe 70% to 80% stocks. You can't do both with a single portfolio. A compromise might not meet either goal. Third, we sell stocks and spend from a retirement income portfolio, but presumably not within an LTC savings portfolio, at least not for many years. A single portfolio would unnecessarily introduce sequence of returns risk into our LTC investments. As you can see, the goals and risk and reward characteristics of a retirement income portfolio are different in many ways from those of a portfolio intended to save for a large, uncertain, future liability. And, that's why I would recommend separate portfolios. Ultimately, what's important is how much money you have and not how many portfolios or accounts you divide it into. Your net worth will be a function of the weighted allocation of all your portfolios. Instead of having two portfolios, one with 90% of your total assets invested in 60% stocks and 40% bonds and a second with 10% of your assets allocated 80% to stocks and 20% to bonds, for instance, you could have one portfolio with 62% stocks and 38% bonds (the weighted average allocation). Your expected returns would be the same in either case, as would your net worth's volatility. But the same argument could be made for budgeting: why not just divide everything into "income" or "expense"? The reason is that you can't manage your finances very well that way. Like putting all of your bills in a single pile and considering only their sum, by creating a single portfolio to address all liabilities, you would have difficulty understanding where you stood at any point in time in meeting your individual liabilities and which might be at risk. That's an important thing to know unless you value all of your liabilities equally. Also, any actions you took within your single portfolio would have an equal effect on all of your goals, whether or not that is what you intended. It's a personal financial management issue. So, why didn't I include LTC cost and other risks in the discussion of spending strategies? Because those risks are different than the longevity risk we try to mitigate with spending strategies. Spending strategies are about maximizing the amount of money you can spend each year and minimizing the risk that you will run out of savings prematurely. An LTC saving strategy would be about paying for a potentially very large, uncertain expense near the end of life. LTC cost risk is just one example of a retirement risk that isn't addressed by a spending strategy, so I guess "the thing that's missing" from those strategies would be the rest of the plan. 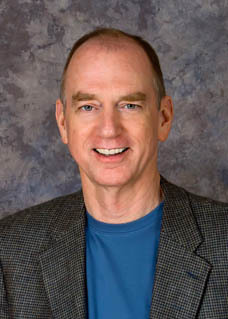 My two previous blogs, The Downside of Upside and Diminishing Returns, initiated a fun conversation with Wade Pfau that he used yesterday to spur a discussion at Wade Pfau's Retirement Research Blog. In those two posts, I expressed the opinion that investing in equities in order to increase a retiree's spending throughout retirement isn't terribly appealing because a) retirees typically — though not always — spend less as they get older and, b) by the time he earns the additional spending with stock market gains the retiree might well be too old to enjoy spending them. Wade's response was, and I paraphrase here, "Well, yes, but retirees don't invest in equities to increase their spending if their portfolio grows." Wade explained that he believes retirees are attracted to systematic withdrawal (SW) strategies primarily by the probability of greater spending than is attainable through investing in safer alternatives (albeit with risks of the opposite outcome). He believes that potentially increasing one's standard of living beyond the initial spending suggested by SW is merely a side-effect of the SW strategy, not a major consideration by retirees or one promoted by advisers. I completely agree with the first part of that statement: the primary attraction of SW is the possibility of greater spending than with safer investment alternatives. The potential to improve one's standard of living throughout retirement if the portfolio grows. The risk, of course, is that none of these potentials will be realized. I would point out that with SW strategies, spending can increase over time, or decrease if the portfolio shrinks. As Michael Kitces pointed out in his critique of "The 4% Rule - At What Price?" by Scott, Watson and Sharpe, SW strategies are seldom implemented in the precise way depicted in that (and other) papers. After portfolios grow significantly, advisers encourage retirees to spend more (increase their standard of living), according to Kitces, rather than stick with their initial withdrawal amount. I trust they would recommend the opposite should the portfolio contract significantly. If this is truly the way SW is implemented, then the retiree would increase her spending contemporaneously with the growth of wealth (and decrease spending similarly if the portfolio contracted). Wade and I actually disagree on very little here. We agree that increasing spending throughout retirement isn't the best reason to invest in equities after retiring. The question Wade and I are asking is this. Is the promise of continually improving your standard of living as retirement progresses a significant incentive for you to invest in equities after you retire? We would both appreciate your thoughts below or at Wade's blog. And if you're an adviser, please let us know. My major goal in writing this blog is to explain retirement finance to people who aren't economists or financial planners. Based on the responses from some of my readers to The Upside of Downside, I failed miserably with that particular effort. If you're one of those readers who felt like he had just swallowed a jawbreaker whole after reading it, here's a do-over. The question I want to consider is "what are the chances that you can increase your spending at age 95 by investing in stocks after retirement and do you really care?" The Upside of Downside may have seemed overwhelming to some because I tied together several different observations to reach a conclusion. The conclusion is that betting some of your secure retirement income in an effort to improve your standard of living as retirement progresses may not pay off as often as you think and, when it does, the increased spending will likely arrive later than you'd like to have it. You can lose your standard of living with systematic withdrawal strategies as easily as you can increase it. SW suggests that you will avoid ruin about 95% of the time, not that your portfolio will continue to grow after you retire 95% of the time. More often than not, based on historical market returns, your portfolio would have declined in real value from its initial balance after 30 years. Most retirees spend more early in retirement than they do later. A typical retiree's spending is highest when she retires and it declines constantly throughout retirement at about 2.3% a year. When it works well, given time and compound growth, SW generates the most wealth when you have the least need for spending (late retirement) and the least wealth when you need it most (early retirement). It takes about 10 years to reliably grow a portfolio 20% or more. So when you're 65, for example, you're investing to increase spending when you turn 75. By the time you're about 80, you will be less active and more consumption will be less attractive. You're a lot more likely to still be living during the first half of a long retirement than the second half. Beware retirement strategies that are back-end loaded. Not all of us see the second half. The easiest way to see the implications is to begin at the end. Let's say you're 95 years old and have just enough money to invest in Treasury bonds and CDs to generate all the income you need for 5 to 10 more years. A financial planner knocks on your door and suggests that you take some of that Treasury bond money and invest it in the stock market so you can maybe have even more money to spend when you reach 105. 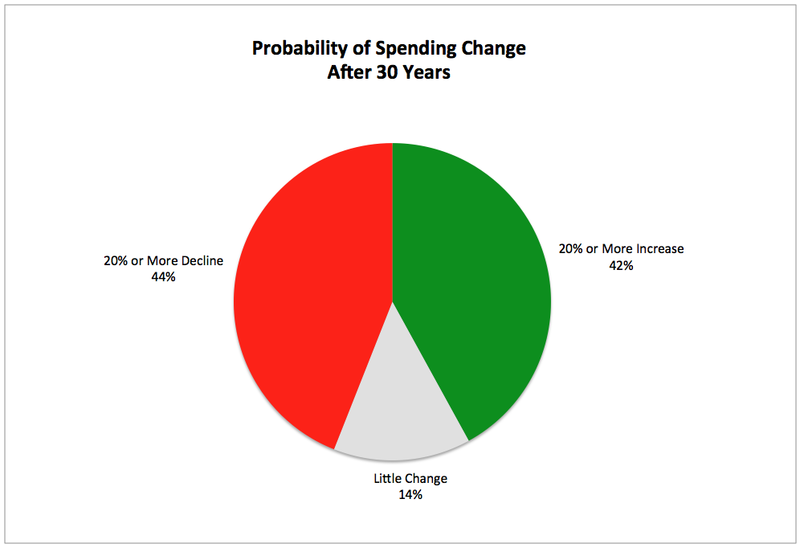 There's about a 45% probability that your spending will increase significantly and a 22% chance it will decline significantly over the next ten years with this strategy. You explain to him that your chances of living to 105 seem extremely slim, maybe 2%, that you're not planning any European vacations, that you don't play much golf, anymore, and that you can't think of anything you would buy if you had more money to spend. Then you chase him through the living room and back out the front door waving your cane at his head. He's amazed you can still run this fast. Now, let's back up to your 85th birthday. You have just enough money to invest in Treasury bonds and CDs to generate all the income you need for 15 to 20 more years. A financial planner knocks on your door and suggests that you take some of that Treasury bond money and invest it in the stock market so you can maybe have even more money to spend when you reach 95. 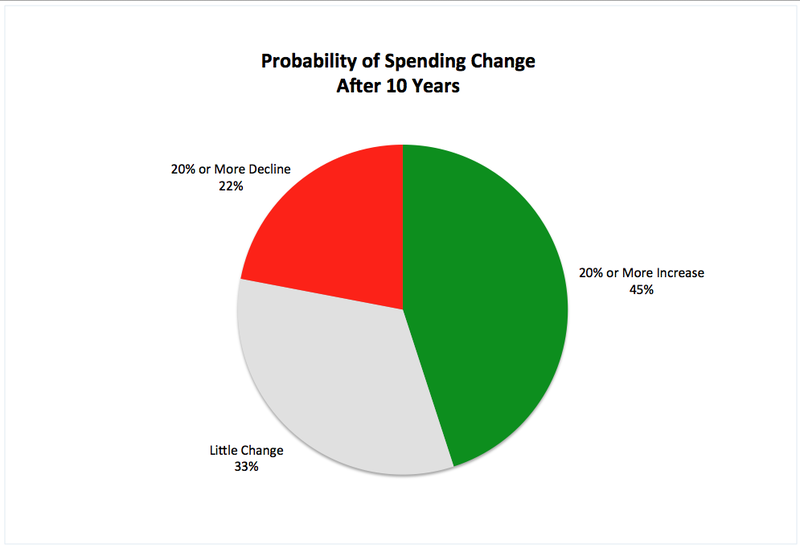 There's a 45% chance that your spending will increase by at least 20% ten years from now, but a 22% chance that it will decline by at least 20%. You ask him if he is aware that a man your age only has a 14% chance of living ten more years to even begin to spend that extra money. He shrugs. At 85, you're not planning any European vacations, you don't play much golf, anymore, and that you can't think of anything you would buy if you had more money to spend if and when you're 95. Then you chase him through the living room and back out the front door waving your cane at his head. He's amazed you can run this fast. Back at age 75 now, you have just enough money to invest in Treasury bonds and CDs to generate all the income you need for 20 to 25 more years. A financial planner who may continue to annoy you for decades knocks on your door and suggests that you take some of that Treasury bond money and invest it in the stock market so you can maybe have even more money to spend when you reach 85. You ask him if he is aware that a man your age only has a 50/50 chance of living ten more years to spend that extra money. He shrugs. You're still fairly active at 75, but doubt you will be as energetic at 85. But he's not promising more money to spend now, he's promising it when you reach 85, which you find less appealing. And it's not really a promise. It's a 45% chance. And maybe your wealth will decline. It certainly isn't attractive enough to bet some of your current, adequate income. You point him back toward the front door and bid him good day. You think you have enough savings to last 30 years, but that's a very long time and you're certainly not sure. A financial planner you will one day regret ever letting into your home knocks on your door and suggests that you take some of that money and invest it in the stock market so you can maybe have even more money to spend when you reach 75. There's an 80% chance that a man your age will reach 75 to spend some extra money and you should still be active then. 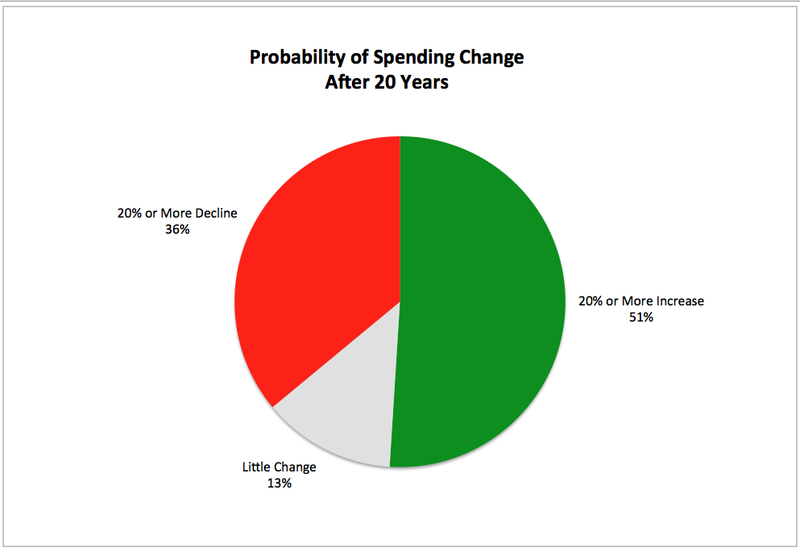 There's a 45% chance you'll be able to spend more, but a 22% chance that your spending will decline. Maybe risking a little of your secure future income in hopes of spending more at age 75, ten years from now, has some appeal. Maybe not. As you can see, the deal looks somewhat interesting at age 65, but as you age, it loses its appeal. You need less money as you get older, you're less likely to live long enough to spend additional money, or to be active enough, and risking some of what you have for certain to maybe spend more ten years down the road makes less and less sense as time passes. This scenario isn't limited to systematic withdrawal strategies. In fact, unless you're quite wealthy, you are likely to have less money to invest in stocks with a floor-and-upside strategy than with SW and, therefore, to have even less potential to increase spending. If you do decide to make the bet at 65, you may want to change your strategy more toward a floor around age 70 or 75. The downside of the bet to generate upside spending potential is that you may not be healthy enough — or even around enough — to enjoy the increased spending even if you win the bet. And, that's most of what I tried to get across in The Downside of Upside. Run those Monte Carlo simulators at brokerage house websites and you will see that it was historically possible (though not probable) to spend 4.5% of your retirement nest egg each year and accumulate a huge amount of wealth over 30 years of retirement with a systematic withdrawal (SW) spending strategy. We talk about using those stock market gains as a means to perhaps increase our future standard of living with certain retirement strategies. But, what are the probabilities that our portfolio will grow enough to increase spending by a meaningful amount before we're too old to really enjoy it? The calculations in this post were made using a "safe withdrawals" spreadsheet downloaded from the Retire Early (RE) Homepage, which uses market data from 1871 to 2003 from the Robert Shiller website. All figures are in real (inflation-adjusted) dollars. 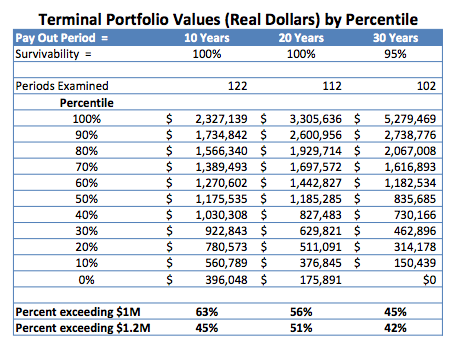 Here are the terminal portfolio values (TPVs) from that spreadsheet for a retiree spending 4.5% of his initial $1M nest egg annually for 10, 20 and 30 years with a 60% stock portfolio. As the table shows, the best outcome was a legacy of $5.279M. 90% of the outcomes were less than $2.738M, but half were less than $835,685. You can see from the frequency distribution of 30-year TPVs in the table below, that in spite of those big numbers at the top of the columns in the table above, most periods (about 56%) ended up with a decline in portfolio value from the original $1M, or an increase of less than 10% and would not have created significantly more spending. The really big numbers are long shots. Let's look at ten-year periods of this SW model's performance because money that's going to be spent in less than about 10 years shouldn't be invested in stocks, anyway, and money invested for 20 years doesn't pay off until we reach age 85 at the earliest. Let's further assume that we would want to live at least five years to enjoy the additional spending after earning it. The following pie charts show the percentage of rolling time periods for ten, twenty and thirty years in which the retiree's portfolio would have grown enough to support additional spending (a 20% or more increase in wealth, shown in green), about the same spending (gray), or a loss of spending (a 20% or greater loss of wealth, shown in red). So, risking your existing standard of living to improve it by at least 20% over the next ten years of retirement works out for you a little less than half the time. Based on historic market returns, about 22% of the time, instead of improving your standard of living after 10 years, portfolio value would have declined at least 20%, lowering your standard of living. These pie charts show only part of the bet you're making with SW strategies. They show the impact of risk on your standard of living. Several studies have shown that when you lose that wealth is critical. Losing the bet early in retirement not only impacts your spending, it has a disproportionate effect on the survivability of your portfolio. Personally, I don't give a rat's hind quarters about increasing my consumption when I am 95. Or 85, for that matter. Having a lot of money at the end of my life to leave to my children is appealing, but betting current spending in hopes of creating even more future spending is quite a different proposition than betting current spending so that I might leave my heirs a bundle. While there are a number of reasons a lot of money would be nice to have late in life, like paying for long-term care insurance or leaving a legacy, the 20-year and 30-year columns in that first table don't interest me that much when I think about increasing my standard of living. I think it is unlikely that I will reach even 85. About 41% of males will and, if I'm one of them, I don't expect that a lot more money to spend will make me much happier. How about the big numbers at 95? Perhaps I could finally afford that classic '62 Porsche convertible I always wanted and drive it until the state takes away my license! Of course, I'll have to be around at age 95 to buy those wheels and a male turning 65 in 2014 has only a 6% chance of reaching that age. Furthermore, safe withdrawal studies like the one on Retire Early Homepage assume that a retiree spends a constant dollar amount throughout retirement. If we really did increase our spending as we accumulated more along the way, say during our seventies, we wouldn't have accumulated those big TPVs later in retirement. Some retirement spending strategies trade off secure future income for the chance to improve our standard of living over time if our stock investments perform well. Purchasing a life annuity, for example, locks in a secure stream of future income for life, but with no potential to increase spending. Investing in a stock and bond portfolio and implementing a systematic withdrawals strategy, on the other hand, offers the potential for increasing future spending but provides no minimum “floor” below which spending cannot drop. How likely are we to both increase our standard of living through equity appreciation after retiring and to be around to enjoy the additional consumption? A desire for a possible higher standard of living that exceeds our desire to preserve our present standard of living. In other words, a continuing willingness to bet. Generating more spending capacity in our eighties and nineties probably won't interest most retirees, because at those ages we will have little time remaining to spend the additional money, we will have an increasing interest in not going broke, and because spending typically declines as we age, anyway. The most economically efficient way to spend would be to match our income stream with our expected expenditures. 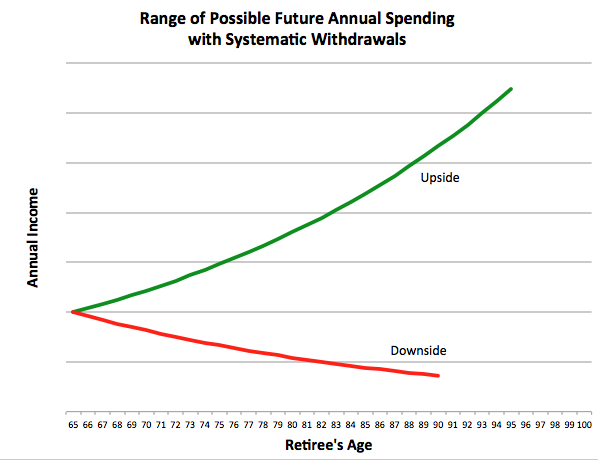 You may recall the following chart from Untangling Retirement Strategies: Systematic Withdrawals. Spending from a SW portfolio would match expected retirement spending best in the downside case, when market returns are worse than we had hoped for. When the market performs well for a retiree (the green line), wealth actually moves opposite the desired income stream, providing the most income when we need it the least. The following table, calculated using Vanguard's life expectancy calculator, shows the probability that a person will live 15 more years beginning at age 65, 70, 75 and 80. Remember, that's 10 years for portfolio growth and 5 years to enjoy it. I'll stop at 80 because that would put the retiree at age 95 after the assumed 15 years. The table below shows the probability that a male or female would live 15 more years at various ages and the last column shows the probability that at least one of them will live that long. There is about a 45% probability that a retiree's portfolio will grow at least 20% over any 10-year period (the first pie chart above) and for a male aged 65, a 63% chance that he will live 15 years to see his portfolio grow and enjoy the additional spending for at least five years. The probability that both of these statistically independent outcomes will occur is about 28%. So, at age 65, a male retiree using this spending strategy has about one chance in four of increasing his standard of living over the next 10 years by investing in equities and living at least five years after that to enjoy it. A female retiree has a longer life expectancy, so her chances of spending more are a little better at 32%, or about one in three. The odds for at least one surviving spouse (usually the wife) being around to enjoy the additional spending are better still, about 41%. The following table shows the probabilities that retirees at the four different ages will both grow their portfolio by at least 20% and be around for another five years after that to enjoy the additional consumption. 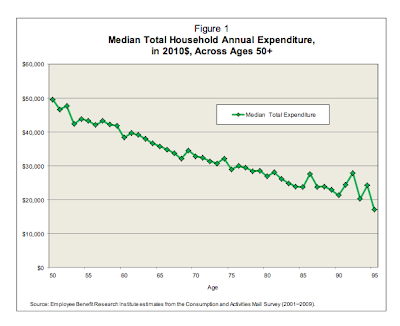 What this table does not show is our health and spending demand at each phase of retirement. Both decline with age. Extra money to spend at age 75 is better than the same amount of money at 95 both because we typically need less as we age and because at 95 we have less time to spend it. A recent paper by Wade Pfau and Michael Kitces shows that, statistically, early retirement is a time for low equity exposure to minimize longevity risk, while later retirement is the safest time to take more stock risk. That is probably true if one seeks to maximize lifetime spending and minimize the magnitude of losses that do occur, and if one lives a long time, but that strategy doesn't provide the additional spending earlier in retirement when most retirees will want it. It's a complex bet, really. Stock-heavy strategies with their sequence of returns risk are most vulnerable in the first decade of retirement when the utility or “usefulness” of more spending is greatest. In other words, the time when it is most useful to bet on the stock market increasing your future standard of living is the same time that losing that bet has the greatest risk of depleting your savings prematurely. Making that bet later in retirement is safer, but the rewards are significantly less interesting. Sometime between age 70 and 75, betting our current standard of living to maybe improve our future standard of living at 85 or 90 if we are still around and active starts making a lot less sense. After age 80 or so, stock investments are more likely to improve our heirs' future spending than our own, a thought that should particularly give pause to those of us who have no heirs. Maybe you're willing to risk some of your existing standard of living at age 65 in hopes of spending even more when you're 75, but are you willing to bet your standard of living at 80 in hopes that you can spend more at 90? When planning retirement, you need to look not only at how much money you might have, but when you might have it. You're best shot at increasing your standard of living after you retire and being able to enjoy the additional consumption is between the ages of about 65 and 75, even though that is the riskiest time to invest. After that, the expected returns diminish significantly along with your life expectancy and health. Stock-heavy retirement strategies make a lot more sense very early in retirement when your goal is to increase spending over time. When a large bequest is one of your goals then, by all means, party on, Garth. Likewise, continue to invest in stocks if you plan to use your upside potential to pay health care and long-term care costs or simply to improve your emergency fund. But, if your goal is to improve your own standard of living, you'll only have about ten years after retiring to grow your portfolio and begin spending more before reaching age 80. It may pay to switch retirement strategies away from upside and more toward a floor after no more than 10 years of retirement and spring for the convertible '62 Porsche while you can still enjoy cruising around town with a breeze blowing through the place where hair used to be.